Everyone wears a mask in some form or another. A work face, a social face, or what have you. There are times when we play a part. The Warners are here to play a part in destroying mankind. But the longer they stay among us, the more they pretend to be like us, the more they become like us. I think the Warners are also relatable because they're a family. They're a unit of spies, but it's a family unit. And they have all the trappings of a family; parenting disagreements, sibling rivalry, etc. Obviously, The Americans on FX was an inspiration for the book, but so was the Fantastic Four. 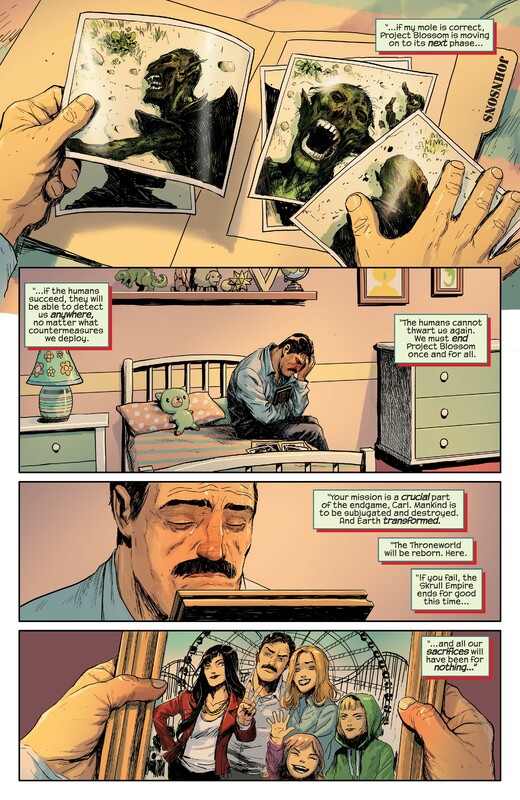 I love the adventures Marvel's First Family go on, and all the amazing characters they interact with, but to me, Reed, Sue, Johnny and Ben are timeless and relatable because they're a family -- with all the good and bad that comes with that. 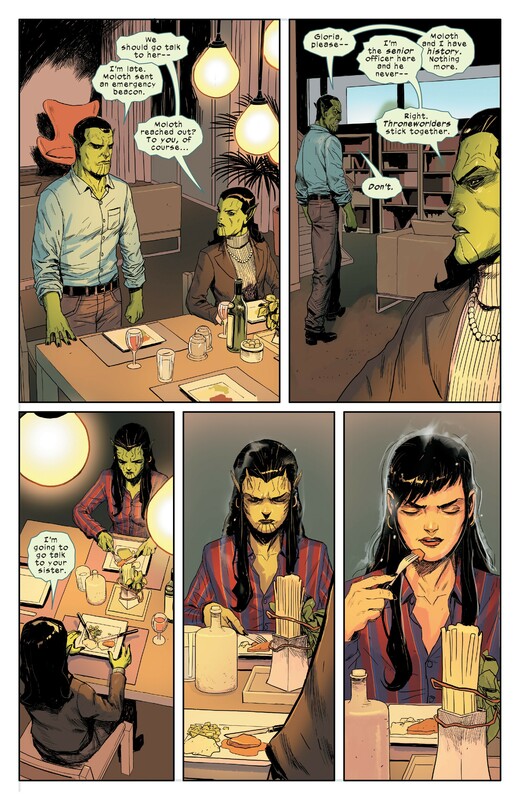 The Warners are a family, too, and our hope is that dynamic reveals that maybe Skrulls aren't so bad after all. This... this is good. I'm intrigued. boy will they feel silly when Galactus comes for his weekly "I will devour the earth!" routine. 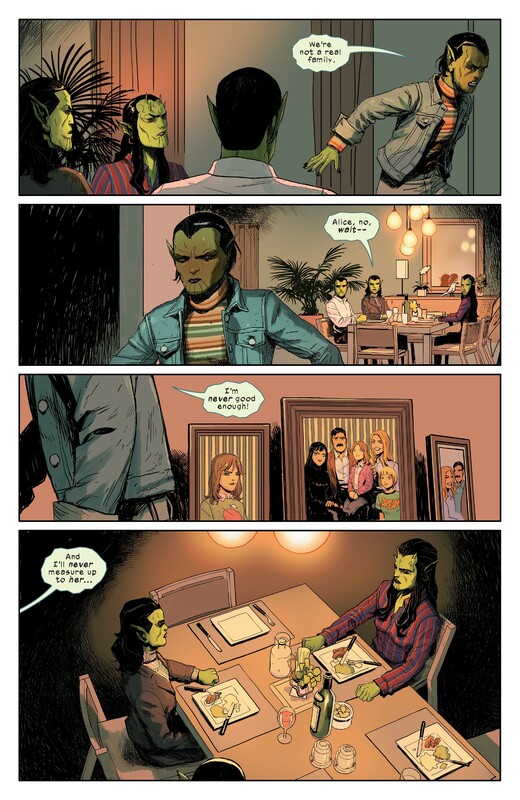 That would be a fantastic way to uncover Skrull spies though. The people that thank the F4 for saving their lives are alien shapshifters. The ungrateful bastards who assume the whole thing was fake are normal MU citizens. Y'know, maybe the Earth isn't worth saving. nah. it would fail because, while the Marvel citizens are some of the biggest most hateful and ungrateful people in all media, even they love the Fantastic Four. It would be great to find undercover Latverian agents, though. See now I'm just thinking about the nice old lady who lived next to the New Mutants. "This time, THIS time the Earth will be ours! Sure we've failed on 75 different occasions to take this mudball but this time, THIS time things will be different. For this time, THIS time we will infiltrate as a family and they will never see us coming like the 75 previous times we have done this. So the humans have telepaths who can detect us and there are special glasses that can notice us but this time, THIS time we shall not fail because we dare not fail!" So the dad is totally having an affair with Moloch, right? Moloch seems like they're the Ex that isn't quite an ex. The father is probably having some kind of long-distance emotional affair with them. I really like the amount of small touches here that tell you so much about the characters. Especially the older daughter shifting to human form after everyone left is just a great way to indicate a familiar story. This is a really cool idea, and I'm digging the execution presented here. Can't wait to see where it goes. 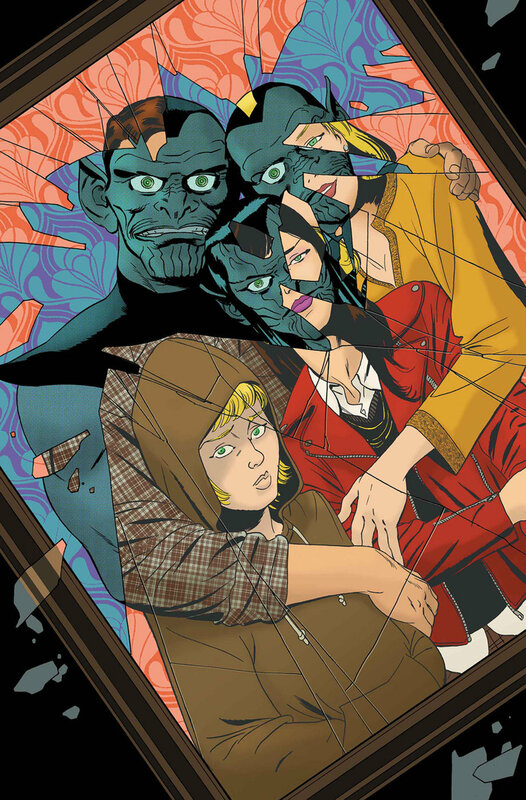 This comic itself makes the reader feel for this family... especially Alice (the youngest daughter who is barely in these scans; she is really going native which doesn't gel well with being a deep cover agent). 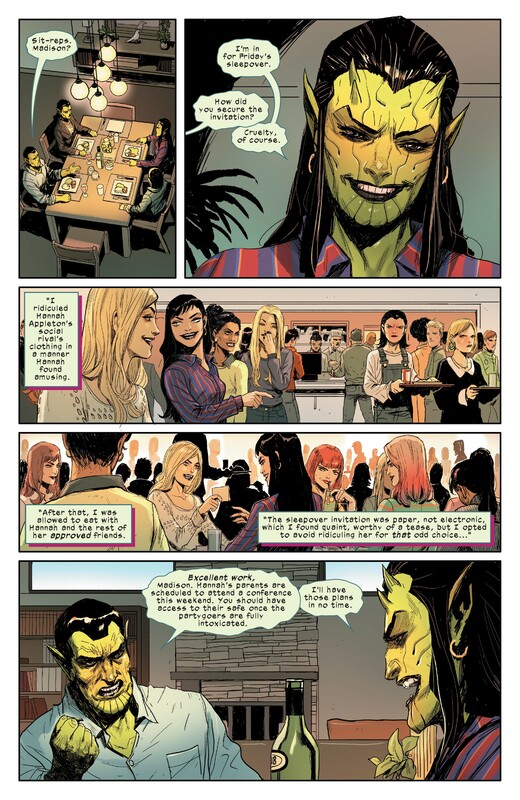 These Skrulls do seem smarter than previous ones. I mean they seem to have created completely new identities instead of swapping places with people. Glad he's upfront about The Americans inspiration because there's really no way to read this and not think of that.